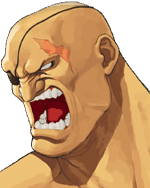 Click here for more information about Sagat's other fighting game appearances. After losing his championship title in the first official Street Fighter tournament, Sagat was devastated. He was at a loss to explain how his victory was stolen away from him by an incomprehensible attack by the young fighter he was about to beat. Seeing that Sagat was saddened and dismayed, M. Bison chose that opportunity to recruit Sagat into the Shadowloo army so he could use his anger and rage to shape incoming soldiers. 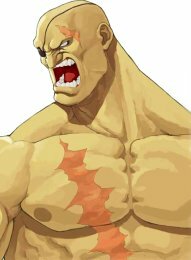 Sagat accepted the position to fill a void of purpose in his life, but he never stopped thinking about that small fighter who managed to knock him out by ripping his chest apart with an abnormally powerful strike. Sagat wished to know Ryu's secret of how he tapped into such power. Sagat wanted that power for himself. He trained night and day mercilessly with his students, perfecting new techniques and honing his power. He waited for the day when he would have a chance to challenge Ryu to a rematch. Sagat was forbidden by M. Bison from competing in the first EX tournament that Bison hosted. Bison needed Sagat in another part of the world for an operation. When Sagat discovered that a second EX tournament was being held, he would not be refused. He alerted Bison to the tournaments existence, which Bison was bitterly upset about. Sagat pleaded for a chance to fight Ryu, but Bison disregarded Sagat's concerns and sent Vega and Cracker Jack ahead to investigate. When Bison set off to visit the tournament personally, Sagat insisted on coming along, and Bison finally gave in, tired of listening to the giant's begging. Sagat prepared mentally for the challenge ahead of him. Sagat ripped through many of his opponents without a second thought, focused only on the moment when he would fight Ryu. That moment finally came. Ryu and Sagat squared off once more. Ryu was very sure to keep the power of Satsui no Hadou in check, vowing never to allow the murderous intent to cloud his mind again. They both fought for a long time, and ultimate Sagat prevailed. By refusing to tap into that dark force, Ryu simply could not muster up the strength needed to topple the kickboxing champion. Having proven to himself what he knew all along, Sagat's victory over Ryu felt hollow. Although he defeated Ryu, the scar on his chest would always remind him of stolen victory. He entered the third tournament to prove to everyone that he was a champion once more. This page was last edited on 15 January 2008, at 19:28.